Top » ENGLISH » STUDY THE WORD OF GOD » WHETHER THE BLESSED VIRGIN SHOULD BE CALLED THE MOTHER OF GOD? OBJ 1: It would seem that the Blessed Virgin should not be called the Mother of God. For in the Divine mysteries we should not make any assertion that is not taken from Holy Scripture. But we read nowhere in Holy Scripture that she is the mother or parent of God, but that she is the "mother of Christ" or of "the Child," as may be seen from Matthew 1:18. Therefore we should not say that the Blessed Virgin is the Mother of God. OBJ 2: Further, Christ is called God in respect of His Divine Nature. But the Divine Nature did not first originate from the Virgin. Therefore the Blessed Virgin should not be called the Mother of God. OBJ 3: Further, the word God is predicated in common of Father, Son, and Holy Ghost. If, therefore, the Blessed Virgin is Mother of God it seems to follow that she was the Mother of Father, Son, and Holy Ghost, which cannot be allowed. Therefore the Blessed Virgin should not be called Mother of God. On the contrary, In the chapters of Cyril, approved in the Council of Ephesus (Part 1, chapter 26), we read: "If anyone confess not that the Emmanuel is truly God, and that for this reason the Holy Virgin is the Mother of God, since she begot of her flesh the Word of God made flesh, let him be anathema." I answer that, As stated above (Q16,A1), every word that signifies a nature in the concrete can stand for any hypostasis of that nature. Now, since the union of the Incarnation took place in the hypostasis, as above stated (Q2,A3), it is manifest that this word God can stand for the hypostasis, having a human and a Divine nature. Therefore whatever belongs to the Divine and to the human nature can be attributed to that Person: both when a word is employed to stand for it, signifying the Divine Nature, and when a word is used signifying the human nature. Now, conception and birth are attributed to the person and hypostasis in respect of that nature in which it is conceived and born. Since, therefore, the human nature was taken by the Divine Person in the very beginning of the conception, as stated above (Q33,A3), it follows that it can be truly said that God was conceived and born of the Virgin. Now from this is a woman called a man's mother, that she conceived him and gave birth to him. Therefore the Blessed Virgin is truly called the Mother of God. For the only way in which it could be denied that the Blessed Virgin is the Mother of God would be either if the humanity were first subject to conception and birth, before this man were the Son of God, as Photinus said; or if the humanity were not assumed unto unity of the Person or hypostasis of the Word of God, as Nestorius maintained. But both of these are erroneous. Therefore it is heretical to deny that the Blessed Virgin is the Mother of God. Reply OBJ 1: This was an argument of Nestorius, and it is solved by saying that, although we do not find it said expressly in Scripture that the Blessed Virgin is the Mother of God, yet we do find it expressly said in Scripture that "Jesus Christ is true God," as may be seen 1 John 5:20, and that the Blessed Virgin is the "Mother of Jesus Christ," which is clearly expressed Matthew 1:18. Therefore, from the words of Scripture it follows of necessity that she is the Mother of God. Again, it is written (Romans 9:5) that Christ is of the Jews "according to the flesh, who is over all things, God blessed for ever." But He is not of the Jews except through the Blessed Virgin. 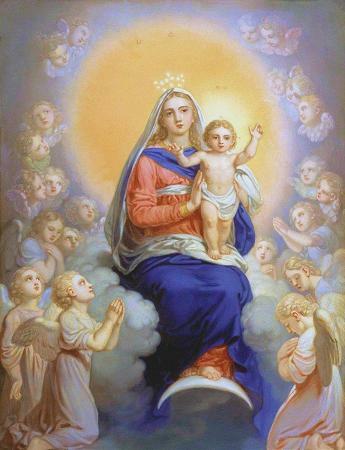 Therefore He who is "above all things, God blessed for ever," is truly born of the Blessed Virgin as of His Mother. Reply OBJ 3: Although the name God is common to the three Persons, yet sometimes it stands for the Person of the Father alone, sometimes only for the Person of the Son or of the Holy Ghost, as stated above (Q16,A1; FP,Q39,A4). So that when we say, "The Blessed Virgin is the Mother of God," this word God stands only for the incarnate Person of the Son. -- St. Thomas Aquinas, Summa Theologica, Question 35, Article 4.